My love of spy fiction isn’t constrained to prose. There are several graphic novels with an espionage theme that have been able to hold their own with the best of spy novelists. 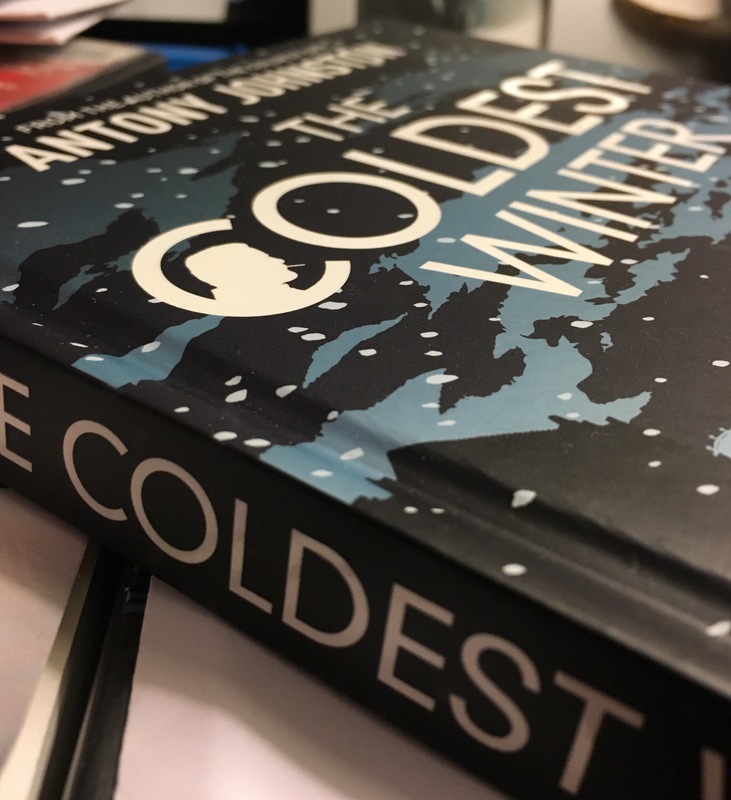 Antony Johnston’s duo The Coldest City and The Coldest Winter are two of them. I’ve been a reader of Antony Johnston’s work for quite awhile and highly recommend it. He’s a bit of a rarity in the comics world because he’s never settled into writing in one particular style. Johnston has written in the genres western, comedy, futuristic apocalypse, fantasy, sci-fi police procedural and more. Beyond that, he hosts a very fun podcast, Unjustly Maligned, which discusses movies or artists that may deserve a second look. My first encounter with his spy writing was a spinoff of Greg Rucka’s must read comic series Queen and Country. 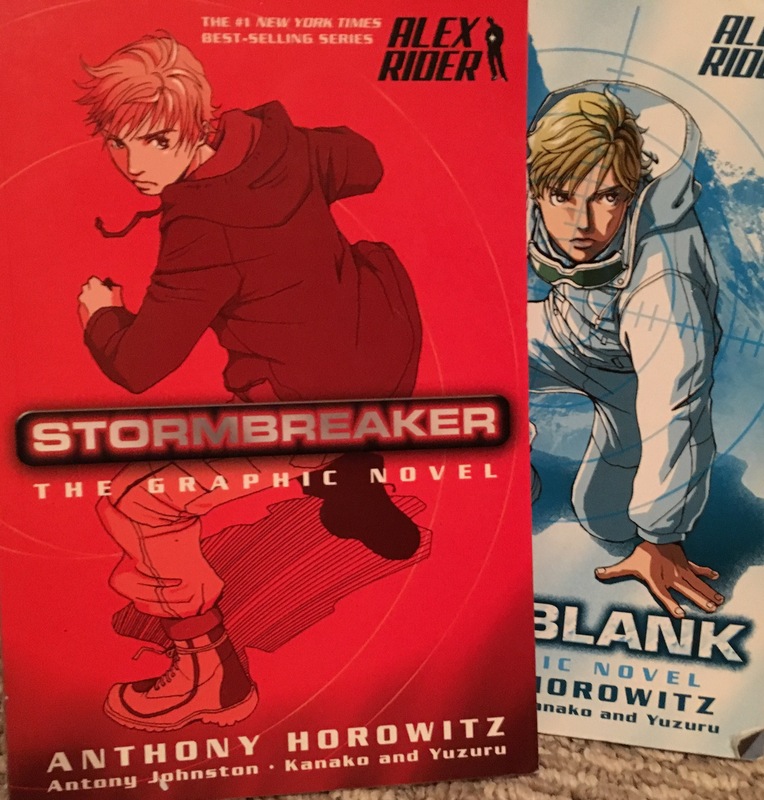 He’s also adapted several of Alex Horowitz’s Alex Ryder YA spy books into graphic novels. 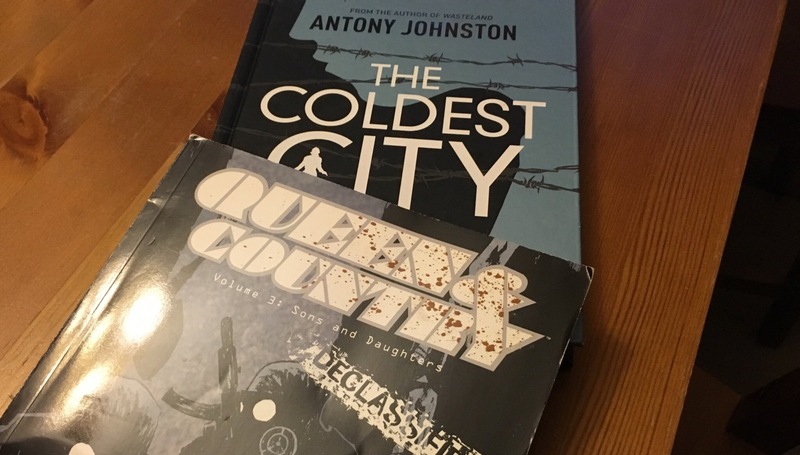 However his biggest spy success was the excellent Cold War era graphic novel The Coldest City which Johnston wrote with art by Sam Hart. The Coldest City is set in Berlin just as the wall was coming down and is just as good as any of Rucka’s spy work. It is currently being adapted into a film with Charlize Theron and James McAvoy coming out in the Fall of 2017. I was able to get some of Johnston’s books signed when he visited Chicago several months ago. 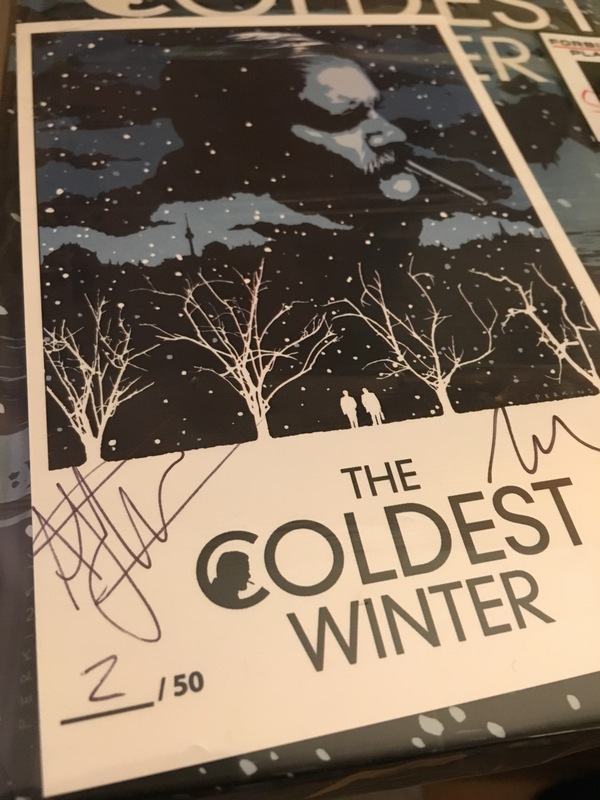 Among a couple of other projects he mentioned having in the hopper, I was very happy to hear he was returning to the spy world with his latest, The Coldest Winter. It came out in December of 2016 and I finally received my eagerly awaited copy with a signed bookplate from the UK. I’m hopeful he’ll swing through town again soon and I can add a signed copy to the collection but for now this is great substitute. 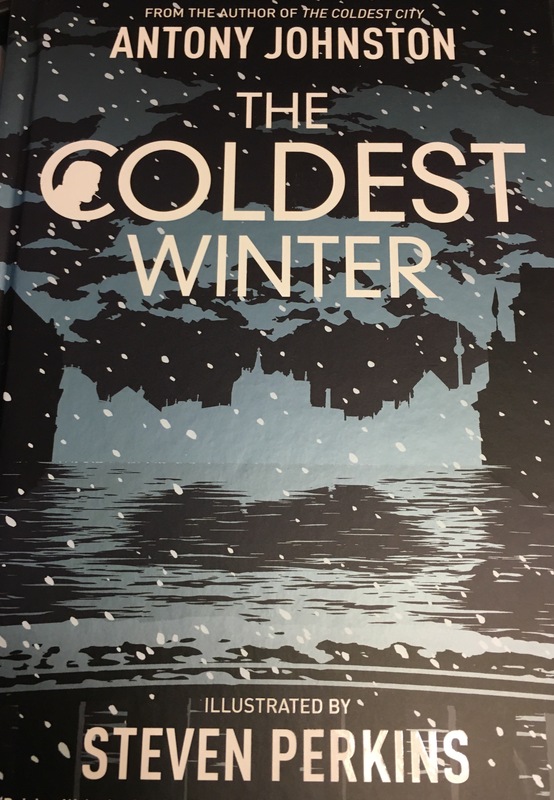 The Coldest Winter is a prequel beginning eight years prior to The Coldest City with a previous supporting character, David Perceval, taking center stage in this new tale. Perceval is a young up-and-coming MI6 agent looking to make his name in one of the most sought after postings during the Cold War – Berlin. He’s tasked with spiriting a defecting Russian scientist out of the city and back to Britain during a severe winter storm. From the opening pages you immediately can tell you’re in good hands with Johnston. We start with a peek at the future before jumping back several weeks and see the story tick down to that opening moment as the tension rises. Fans of John le Carré, Len Deighton and Adam Hall will appreciate how all the pieces of this classic espionage tale click into place. In particular, Perceval emerges as a spy you can root for and will have you digging out your copy of The Coldest City to re-read to see the rest of his story. 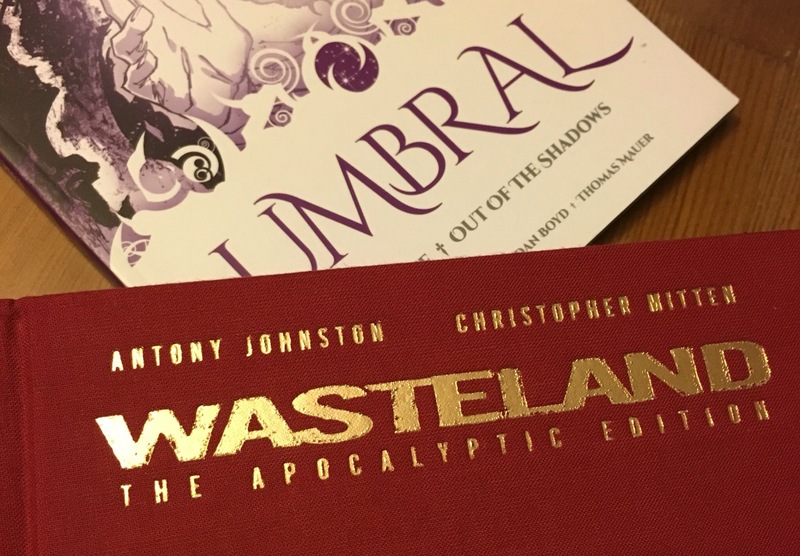 We’ve seen this type of tale in film and books before, but not in this format. Although Johnston isn’t necessarily breaking new ground in the end it doesn’t matter. This plot is a classic for a reason and if the story is done as well as this one, it is worth telling again. Steven Perkins’s art is outstanding and a perfect match for this story. He makes wonderful use of negative space and his black and white drawings excel in the outdoor snowy scenes. I guarantee you’ll be feeling chilly by the time you’re done reading. The standout is a thrilling, mostly wordless, car chase in the slick, snow covered Berlin streets. It has just the right combination of energy and tension needed to convey that type of action via images. I’d be remiss if I didn’t mention the cover art. I’d been looking at it for months before noticing the hidden image. It’s the perfect symbol for the double world in which spies live. This has always been talked about as a trilogy and I’m excited to see where Johnston goes next. Perhaps a reverse trilogy, stepping back in time like George Lucas had hoped to do with Indiana Jones? Or jump to the mid-eighties? Whenever we end up in Berlin I’ll be there, ready to read, hat and mittens on against the cold.